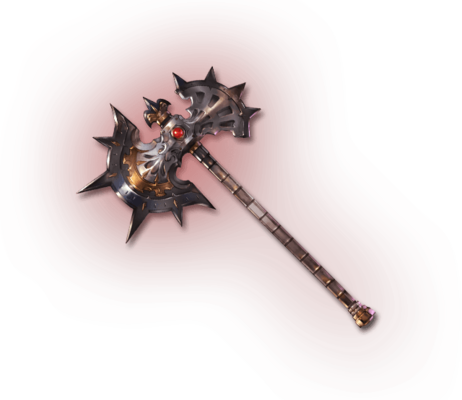 Equal parts instrument of punishment and implement of execution, this axe is wielded to mete out bloody justice amid the insanity of the battlefield. Thus, to grip its haft is to surrender oneself to the iron madness of blood lust. Unaffected by Charge Bar Speed status effects. No effect when afflicted by Shorted debuffs. No effect when Charge Bar is above 100%. Barbarian's Essence This is the essence of greatness. Gain its power by using emblems. Strength: 50% chance of dealing 50% more damage. Note: This is the amount you get for a 5★ uncapped weapon. Weapon versionsThis weapon has alternate versions. This page was last modified on 18 November 2018, at 14:33.